Harper Lee is publishing a second book at 88, fifty-five years after "To Kill a Mockingbird," her first book was released. 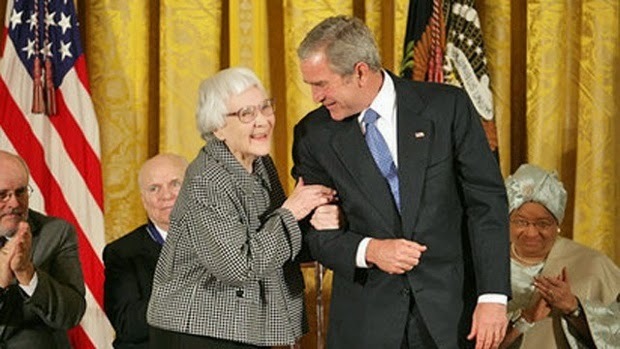 With the working title, "Go Set a Watchman," Harper Lee completed the manuscript in the 1950s and then it was set aside in favor of "To Kill a Mockingbird." In a statement released today by her publishers, the new books has been slated to be published July 14, and it follows Scout, the little girl of "Mockingbird," as an adult. The manuscript was rediscovered last year, Lee, 88, said in a statement from her publisher, Harper. "In the mid-1950s, I completed a novel called 'Go Set a Watchman'. It features the character known as Scout as an adult woman, and I thought it a pretty decent effort. My editor, who was taken by the flashbacks to Scout's childhood, persuaded me to write a novel (what became 'To Kill a Mockingbird') from the point of view of the young Scout. "The existence of 'Go Set a Watchman' was unknown until recently, and its discovery is an extraordinary gift to the many readers and fans of 'To Kill a Mockingbird.' Reading in many ways like a sequel to Harper Lee's classic novel, it is a compelling and ultimately moving narrative about a father and a daughter's relationship, and the life of a small Alabama town living through the racial tensions of the 1950s." "She [Scout] is forced to grapple with issues both personal and political as she tries to understand her father's attitude toward society, and her own feelings about the place where she was born and spent her childhood." The book is about Scout -- Jean Louise Finch -- returning to her hometown of Maycomb, Alabama (a fictional version of Lee's hometown of Monroeville), to see her father, the upright lawyer Atticus Finch. "To Kill a Mockingbird," which Lee wrote after she moved to New York, made her name. The book, published in 1960, won the Pulitzer Prize and was made into a beloved 1962 film. Gregory Peck won the Oscar for best actor for his portrayal of Atticus Finch. It's a mainstay of high school reading lists and, as of 2006, had sold more than 30 million copies.